The Seacoast Learning Center - Children's Dyslexia Centers, Inc. Welcome to the Seacoast Learning Center. We tutor dyslexic children on a one-on-one basis, twice a week, for 2 years for free. The tutoring is performed by dyslexia practitioners and trainees using Orton Gillingham clinical techniques. Our dyslexia practitioner certification training is free to in-clinic trainees. The Center also provides in-school training for school based dyslexia practitioners. Located in Rochester, NH, we service NH, southern ME, and northern MA. Dyslexia, also known as a specific learning disability by schools, is an under reported disability. Dyslexia is an inheritable, neurological, condition that affects your language acquisition, processing, and decoding abilities. Up to 20% of the population in the US has a learning disorder and 80% of these people, many of them children, are afflicted to varying degrees with reading disorders that qualify as dyslexia according to a NIH (National Institutes of Health) estimate. Dyslexia is a disability in learning, not in intelligence, and afflicts girls and boys nearly equally. Children with dyslexia are typically highly creative, intuitive, and are excellent hands on learners. Dyslexia is a lifelong, incurable, condition. With early detection and treatment children with dyslexia can still learn and succeed academically. The teacher always seeks to understand how an individual learns and to devise appropriate teaching strategies. Each lesson is planned for a particular student. Infinitely adaptable, Orton-Gillingham is flexible; it is an approach rather than a system. The instructor presents the material in direct and explicit fashion. Never is the student expected to know anything that has not been taught and practiced. The Orton-Gillingham approach is based on a technique of studying and teaching language, understanding the nature of human language, the mechanisms involved in learning, and the language learning process in individuals. The Orton-Gillingham approach is multisensory. Sessions are action-oriented with auditory, visual, and kinesthetic elements reinforcing each other for optimal learning. Spelling is taught simultaneously with reading. In this respect, Orton-Gillingham differs from traditional phonics instruction. The elements of the language are introduced systematically. Students begin by reading and writing sounds in isolation. These are blended into syllables and words. The various elements of the language-consonants, digraphs, blends, and diphthongs are introduced in orderly fashion. Students learn about the history of the language and study the many generalizations and rules which govern its structure. Again and again, they are encouraged to think, rather that to guess. When a child struggles with reading, writing, spelling, and sometimes even speaking, it is possible that the problem is due to dyslexia. This does not necessarily mean that a child displaying them has dyslexia. However, if a child continues to display difficulty over time in the areas listed below, testing for dyslexia should be considered. I Think My Child Has Dyslexia. What Do I Do? A formal evaluation by trained professionals must be conducted to diagnose dyslexia.Testing can be conducted by schools and professionals trained in the assessment ofintellectual functioning. The International Dyslexia Association provides resources tofind a trained professional in your area. If you think your child may have dyslexia wecan help. Please contact the Seacoast Learning Center Director for more informationor download our student application packet and apply today. The Seacoast Learning Center relies on fund raising, grants, and donations in addition to the financial support provided to us by the Scottish Rite Masons (Northern Masonic Jurisdiction) to fund the free services we offer. For more information on how you may volunteer please contact us. For more information on our fund raising events please visit our special events page. To make a donation please visit our donations page. The Seacoast Learning Center will be holding our annual “Casino Gaming Night” fundraisers throughout the year, taking place at the Ocean Gaming Casino located on Hampton Beach, NH. The Seacoast Learning Center holds an annual Golf Tournament fund raiser in September. This is our most important fund raiser of the year. And you don’t have to play golf. The Seacoast Learning Center will hold our graduation in May this year in Rochester, NH. More information will be available as the date gets closer. I went to the Learning Center for 4 years. When I first learned that I was dyslexic I was scared because I didn’t know what dyslexia was. I thought there was something wrong with me and I did not know what to do. It was very confusing for me. The teachers at my old school tried and tried to help me but I just couldn't get it. I thought I was stupid. I was 9 years old when I started to go to the Learning Center. At first I didn't want to go because I thought it was boring. But as I progressed I saw it was really helping me a lot. The Learning Center helped me gain confidence in myself. After passing the first level I wanted to read more because I knew I could do it. As I passed each level it felt like winning a gold medal in the Olympics! The Learning Center taught me how to read and break down difficult words. Because of what I learned I am able to go to the 8th grade, and I know that I will be able to keep up with my class. Because of the Learning Center, I know that I can do anything if I put my mind to it. It was hard for me to learn how to read, but I did it. Kids picked on me because I was at a lower reading level. I felt stupid and dumb. I was very depressed. I hated to get up in the morning. I wanted to stay home and sleep all day or watch TV. I just couldn't face the world. I didn't want to see my teachers; I didn't want to do homework. On the first day I went to the Learning Center, they made me feel welcome. I got to meet all the other kids that had dyslexia. I saw some older kids that had been there for a while, and they said that it was really fun-it wasn't like school. From the 1st day I really started to like it a lot. When I started at the Learning Center I was 11. And I'm 14 now. I read more often, and I am happy when I read. I really enjoy it better. I understand what I'm reading. And I go to school and I do well now. And I get good grades. Before, I wasn't doing very well. I didn't put any effort in it. And now I put in tons of effort, and I get something out of it. I didn't think I could ever go to college or amount to anything. And now I can, and I want to go to college, and I want to have a good life. I want to be a teacher for kids with dyslexia. I want to show them what I learned. I want them to understand that they can do better in their lives, that they can move on. Dyslexia doesn't have to be the end of everything. Words can not express how thankful I am for the work you and the Dyslexia Center has done for my son Charlie. My son’s inability to read caused so much stress and anxiety for him. Now that his Dyslexia has been identified, and he has been accepted into this program, a huge weight has been lifted off my heart. I am thrilled with the progress Charlie has made over the past year. Nothing warms my heart more than seeing my son pick up a book to read. I would like to take a minute to thank you for all the help you have given our daughter. She was diagnosed as “Dyslexic” very early and it’s been a real struggle for all involved, but no more so than for our daughter. Throughout, your school has been tireless in its efforts to help us educate our daughter. For the last several years she has been attending your school and the results have been obvious. This year, in particular, huge strides were made. From her time with you and for everything you’ve done, we are eternally grateful. We will keep your school and its wonderful staff in our prayers. Thank you so much for your help over the past few years and for everything. It means so much for our family and especially our daughter Sophia. The expert level of instruction and constant support throughout the training gave me a very meaningful experience at the Seacoast Learning Center. The training was in-depth and provided me with an incredible amount of resources to add to my professional practice. This instruction has provided me with a systematic approach to using multisensory instruction that is more individualized and appropriate for my students. I absolutely suggest this program to others! Having the opportunity to see two students progress and gain confidence in their abilities has been so rewarding. The support from the staff including specific feedback, suggestions for my lesson plans, and personal , one-on-one observations and feedback have cemented my understanding of the practice and exceeded my expectations. 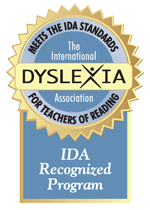 The Orton Gillingham training program is also recognized by the International Dyslexia Association (IDA) as meeting all of their Knowledge and Practice Standards. The Children’s Dyslexia Centers, Inc. Orton Gillingham training program is accredited by the International Multisensory Structured Language Education Council (IMSLEC). These accreditations reflect the quality of training provided by the Children’s Dyslexia Centers, Inc. and demonstrates our program meets the highest standards in the field. Thank you for contacting the Seacoast Learning Center. We'll get back to you as soon as we can! I consent to Seacoast Learning Center collecting my details through this form.